Though artist Charles R. Knight (1874-1953) was plagued with vision problems for most of his life, he managed to leave behind an amazing body of work—and to somehow look back into the prehistoric past like no one else could. The Brooklyn-born Knight’s talents were impressive and adaptable, but his love of animals led to an early affinity for drawing all creatures great and small, whether it was the family pet or lions and elephants at the zoo. Later, Knight’s career ran parallel to the desire of American natural history museums to showcase what had been unearthed in scientific expeditions, and he was commissioned for various prehistoric murals that have awed and inspired visitors for nearly a century. 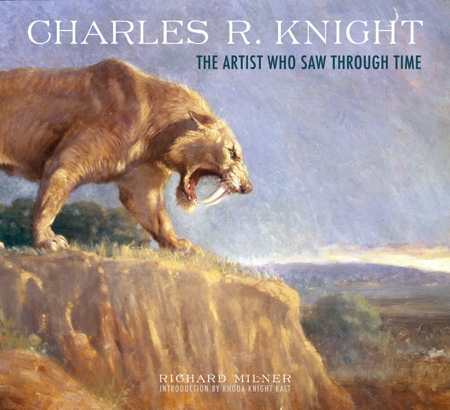 Author and anthropologist Richard Milner’s homage to Charles Robert Knight, an artist who did indeed see through time, features fine color illustrations of Knight’s work along with a biography of this unusually gifted man. Knight’s thorough research and eye for detail are noted, as are the sense of drama and scene that made his murals so distinctive. Knight’s creatures were never flat or stiffly posed, but instead came to life in colorful action—flying, hunting, lounging about, or fighting for survival of the fittest. The book’s quote from the late paleontologist Stephen Jay Gould captures the artist’s genius: “Not since the Lord himself showed his stuff to Ezekiel in the valley of dry bones had anyone shown such skill in the reconstruction of animals from disarticulated skeletons.” When this type of skill, imagination, and ability to complete exhaustive projects came together, the results were magnificent. Milner’s inclusion of personal details about Knight, such as his fifty-year marriage, his contempt for the burgeoning modern art movement, and his frustration regarding his troubled eyesight are additionally compelling, as is the book’s heartfelt introduction from granddaughter Rhoda Knight Kalt. Knight’s legacy continues through the preservation of his works at institutions like New York City’s American Museum of Natural History, and also in his classic Animal Drawing, a reference text that is still in print. Animal Drawing offers the sage advice that while technical finesse is important, the artist’s greatest motivation should be “the joy of deeper understanding of Nature’s story.” Knight clearly knew that joy himself and generously shared it with us all.